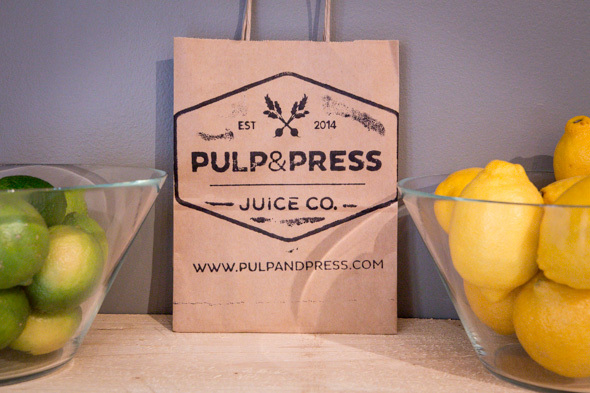 Pulp & Press is the brand-new Toronto offshoot of a London, Ont.-based juice company. What began as a plan to do a juice cleanse quickly turned into a business late last year for co-founders John Parlow and Christian Vemb; one industrial-grade hydraulic juicer later, the duo's cold-pressed, organic blends are found in yoga studios, organic markets, and other health-oriented businesses all around southern Ontario. 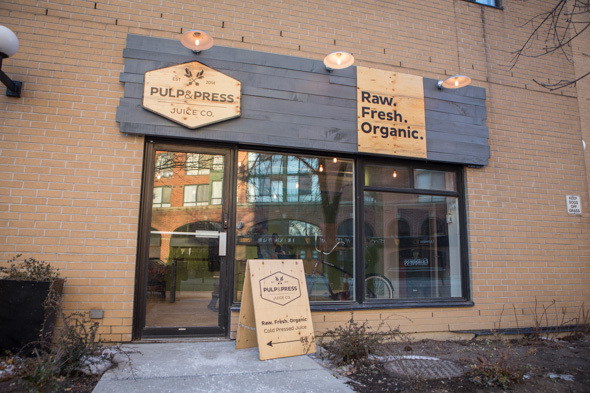 Their burgeoning juice empire is now extending to Toronto; in addition to getting their bottled juices into all Balzac's Coffee locations, the company decided the time was right to carve out their own spot for juice lovers in the Big Smoke. 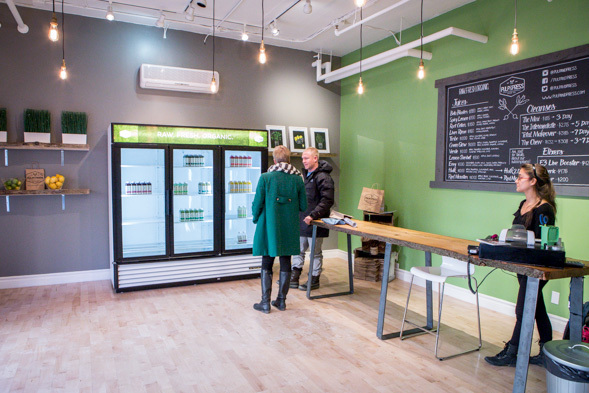 The new juice bar, at King and Niagara, is a bare-bones, industrial-chic spot coated in a springy shade of green. They don't make their own juices on the premises - instead, it's exactly the same stuff as you'd get in London, brought in (via refrigerated van) in small batches every couple of days from their production facility. The fridge is stocked with a dozen or so different blends, with each 16oz. bottle containing three to four pounds of fresh, organic produce. Though fruit features prominently in many of the blends, they tend not to trend toward the overly-sweet. 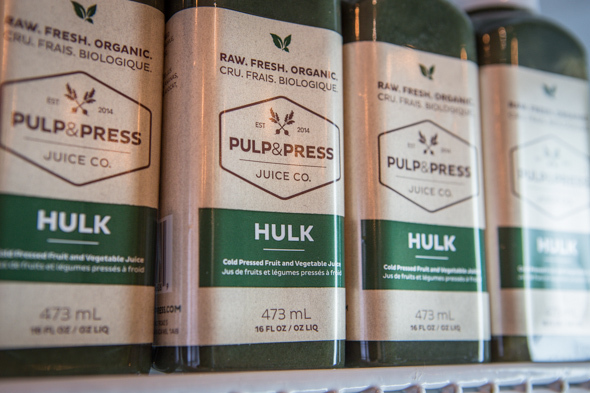 Their most popular is the Venk-invented Hulk juice ($10), a blend of apple, pineapple, cucumber, kale, avocado, lime and spirulina. Though Vemb admits the swampy colour is off-putting to some, "I give them a personal guarantee - not one person has never not liked it. I'm still batting 1000 on that one." He adds that it doesn't taste like a "green" juice - for most drinkers, the pineapple or cucumber flavours stand out the most (I fall into the latter camp). Another fave is the Red Monster ($10), which features just apples, cucumber, avocado, lime juice and beets (which gives it its characteristic hue). Interestingly, this one tastes like it should be green - the absence of tropical flavours let those refreshing veggie notes really stand out. If you're looking to do a cleanse, they offer three-day ($165), five-day ($275) and seven-day ($385) options; there's also a plan called The Chew, which includes one meal daily for the length of your cleanse ($132-$308 for three to seven days). "People who are afraid of not chewing from three to seven days can get a lot of benefits out of the cleanse, but (they can) still have a meal," Vemb says. 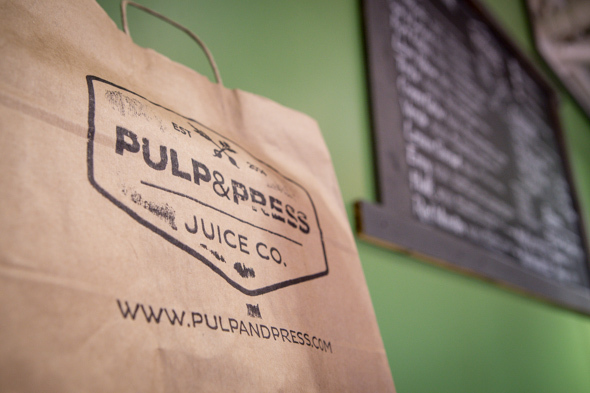 Now that they've got a stronger Toronto presence, look for Pulp & Press juices to pop up in more locations around the city - they're in talks to get their products into some downtown lunch spots.